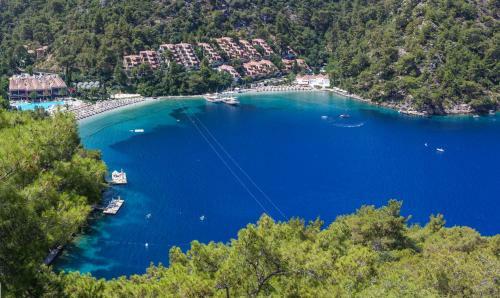 Known for its natural landscapes and Aegean blue waters, Turkey is probably on every traveler’s bucket list. But if you don’t like the sand to get in your hair, steer away from the crowded beaches and stay in city of Denizli! Ironically, Denizli means “with the sea” but this city is the exact opposite! Instead, you’ll find yourself walking and exploring downtown. With all the museums, parks, and shopping areas, you’ll never run out of things to do. Prepare to literally get swept off your feet and enjoy the city life Denizli has to offer. Here’s our list of top 10 Airbnb vacation rentals in Denizli, Turkey you must check out! Those traveling in big groups will love this bright and comfortable studio apartment that feels just like home. Located in Denizli’s city center, this apartment is the perfect place for those visiting Pamukkale. It is complete with a fully furnished kitchen, clothes washer, air conditioner, couch, bathroom, and shower. The accommodation also includes free breakfast and wi-fi and can accommodate up to five guests. The best part? This homey studio apartment is as comfortable as it looks that you might end up staying longer than your usual vacation! Traveling solo to Denizli? This should not be a problem! You can stay in this budget solo room in Yildirim Hotel. Although smaller than your usual rooms, it is complete with a single bed, private bathroom, and bathroom essentials — just enough to get you by. Although priced at a cheaper rate, it is equally comfortable and worth your money. It is also strategically located near the transport terminal so you can easily get around. Guests can check in with the doorman and building staff hassle-free. Like what they say, it’s better than sleeping in the park! Right? Impress your partner and book this private room in Pamukkale for your stay in Denizli! This modern and beautifully decorated private room is in a duplex loft located near public transportation, parks, and the city’s center — that’s everything you need when you’re always on the go. Of course, while you are at it, have a romantic time looking just by looking at the comforting and scenic view from the balcony. Although this is recommended for couples, solo adventurers are also welcome! This room is a treat for anyone who loves a good view and comfortable stay. Have a blissful stay in this charming pine terrace room located less than a kilometer away from Camlik street and the forest. The one-bedroom Airbnb is located in a warm and peaceful area just free from the rowdy crowds and bustling city life. Who doesn’t love peace and quiet? Travelers are definitely going to love the rooftop as they can enjoy the refreshing view of the city. They don’t just call this place “charming” for no reason. If you and your loved one are feeling fancier than usual, this lovely hotel suite will definitely make you feel like a king and queen! Spend your vacation in this suite in Konakk Residence Hotel. Each suite comes with two beds, a bath, and other amenities such as an air-conditioner, cable TV, heater, etc., and can accommodate up to three guests. The hotel is just strategically located in a well-known area in Denizli, next to the Kinikli Migros Supermarket at Bursa Street, and on the way to Pamukkale University, right at the heart of the city. To top it off, the hotel has a 24/7 guest service that is sure to treat you like royalty. Crash in this beautiful and modern Pamukkale flat when you visit Denizli. This flat can accommodate up to four guests in one bedroom with a double bed and two couches. It is quaint yet comfortable and convenient for those who love to explore outside as the flat is just a short distance away from the bus terminal. Each flat is complete with air-conditioning, heater, iron, and a laptop-friendly workspace for those who need to squeeze in a little work for the holidays. Although you might have to bring your luggage up a few steps through the stairs, reaching the top (room) definitely makes it worth it. Nothing sounds better than traveling on a budget! Those on-the-go travelers who are just looking for a place to crash could use this quaint room in the city’s center. Though it may be small, the space is cozy and chill. The flat can accommodate up to four guests in a bedroom with one bed and bath. They even have a well-equipped kitchen. Everything is easily accessible and the flat is located in the city’s center. Guests can walk to the terminal and grocery. Now you can go and explore Denizli without breaking your bank! In case you find yourself traveling to Denizli alone, you can definitely stay here in this budget solo room! This house doesn’t actually have a separate guest room but rather they use their living room as a guest area. Contrary to popular belief, it is actually safe, spacious, and comfortable. You can go in anytime whether after dinner, tea, or snacks as check-in time is flexible. Past guests also said the experience was really warm and welcoming. ı am afraid you will stay one more night..
Want to experience the Denizli charm? Then you’re going to love this VIP Suite. It’s modern interiors and furniture is pretty, light, and really comforting. The suite is equipped with high ceilings giving off that cool and clean ambiance. It is complete with one bed and one bath with clean towels and sheets. They even have a huge flat-screen television with satellite channels, iron and ironing board, and free Wi-FI. The best part though is that it’s not as expensive as it looks! Those eyeing a picture-worthy yet comfortable accommodation should definitely check this out! Those who love the outdoors can stay in this cozy room located in a friendly neighborhood! The apartment is just near the school, university, and hospital so travelers can engage with locals left and right. (Of course, engage at your own risk.) Besides the friendly neighbors, this cozy room is complete with air-conditioning, a heater, a laptop-friendly workspace, and a washer. The apartment also allows travelers to bring their furry friends or pets. If you’re all about the city life, you’ll never get bored in Denizli. Stay in the city’s center and witness Turkish culture come to life. Make friends with locals and just enjoy the bustling environment the city has to offer — whether it means exploring downtown or sightseeing in the museums nearby. You’re sure to be swept off your feet in this beautiful city - just remember to book in one of our top 10 Airbnb vacation rentals in Denizli, Turkey!